A luxury addition for some vehicles, the sunroof gives drivers and passengers a way to see the sky, to let more light into the vehicle on a sunny day, or to circulate air. Current designs for sunroofs fall into a few general categories, including the simple hinged version that lifts up on one side, a version that can slide back over the roof and slightly tilt up at the back, and another that slides into a cavity in the vehicle's roof for storage. While these concepts have been around for quite some time already, Apple believes it can go one better. 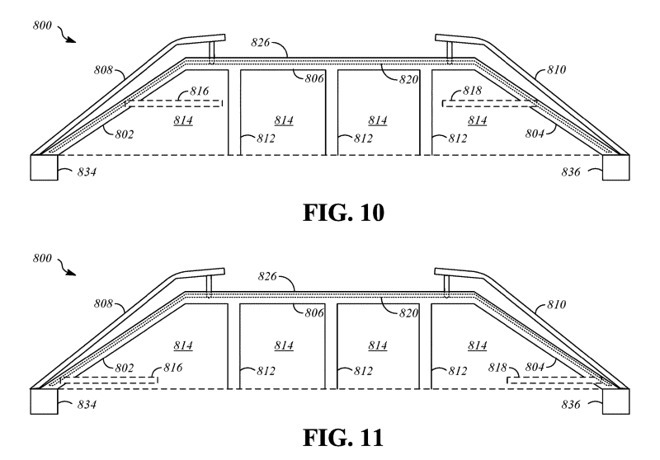 In a patent granted by the US Patent and Trademark Office on Tuesday, "Movable panel assemblies" describes a multi-part car roof system that can be opened, closed, and altered in a variety of different configurations, depending on the user's preference. Apple's sunroof design consists of two panels, each capable of fitting flush with the rear section of the roof and the front panel or windscreen. The two panels are fitted to tracks on either side of the vehicle, which can be moved into position by electric rollers, with each able to be popped up and down in place as well as sliding forward and back. In its more conventional applications, the panels can be popped up and slid over the front and back sections. While the back panel can slide over the back, the front can also have the rear section tilted up, angling incoming air away from the roof opening and its passengers. As the front panel can tilt up, it is possible for the rear panel to be slid forward, fitting underneath the raised section. This would give the effect of opening the sunroof just for the back of the vehicle, while keeping the front completely covered. On the more exotic side, Apple suggests the sections covering the windscreen and rear window, beyond the two panels, have the opportunity to lift out of place on their own. In this configuration, it is possible for the two roof panels to remain where they are, while the other sections can be lifted away. The extra lifting areas may also provide an extra use, in getting those sections out of the way while the roof panels are lowered into the vehicle. Diagrams show the track can extend extremely far forward and back, inside the vehicle, potentially allowing the panels to be brought inside completely. The extended tracks can also allow the roof panels to be brought down over the windscreen or rear window sections of the vehicle, though in these cases it would be likely the panels would need to be made from glass or another approved transparent material, except in cases where a fully self-driving vehicle is allowed to move without user intervention at all. There is also the potential for the panels to be stacked, raised to different heights so they can be slid on top of each other. Lastly, the patent also covers how the panels would work for a vehicle with a lifting rear door for accessing storage, one that would also contain a track and could hold the roof panels while opened. While patent applications are filed with the USPTO by Apple on a regular basis, with many also granted to the company, there is no guarantee that the ideas explained in the filings will make an appearance in a future product or service. It does, however, advise of areas of interest for the company. 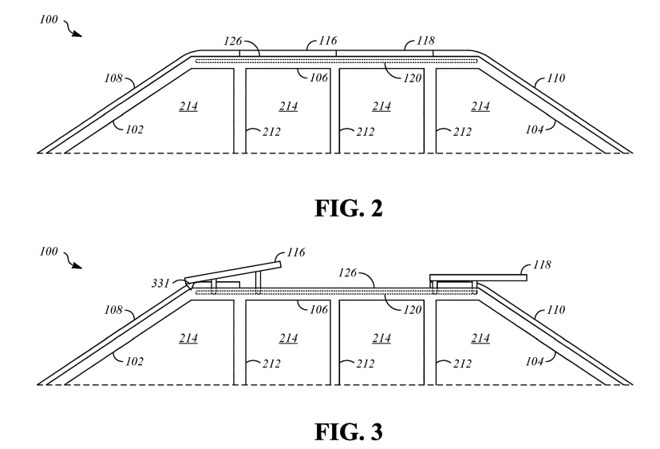 This is not the first time Apple has attempted to reinvent the sunroof. 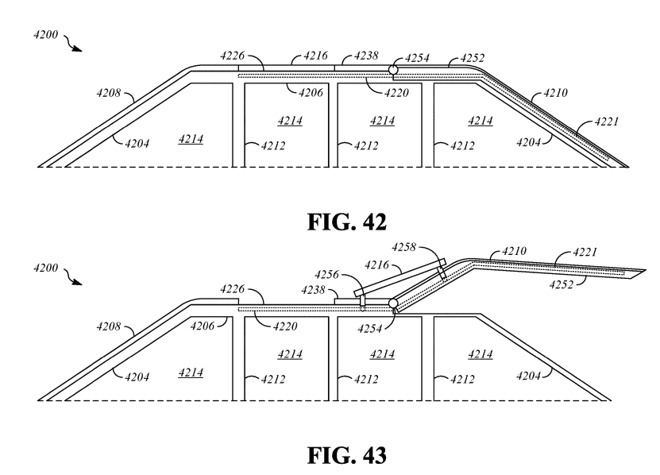 A patent granted in August 2018 describes a sunroof system that uses multiple tracks to slide a panel along the top of a vehicle, specifically one that does not use straight and parallel tracks. Apple has also secured patents and made applications in a number of other areas of car design, including automatically adjusting seats that anticipate crashes, embedded fiber optic systems, inter-car communications, automated point of interest capture systems, and smart seatbelts. 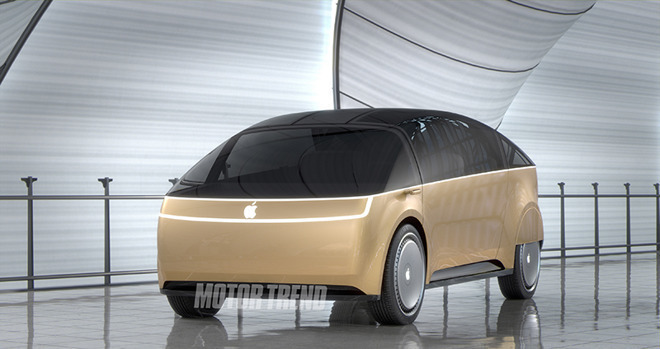 The company's car-related efforts are largely under the banner of "Project Titan," which was originally thought to concern the design and production of a branded Apple car, but has in more recent times shifted just to self-driving systems. Currently under testing in California using a fleet of vehicles, the project's ultimate goal is largely unknown.